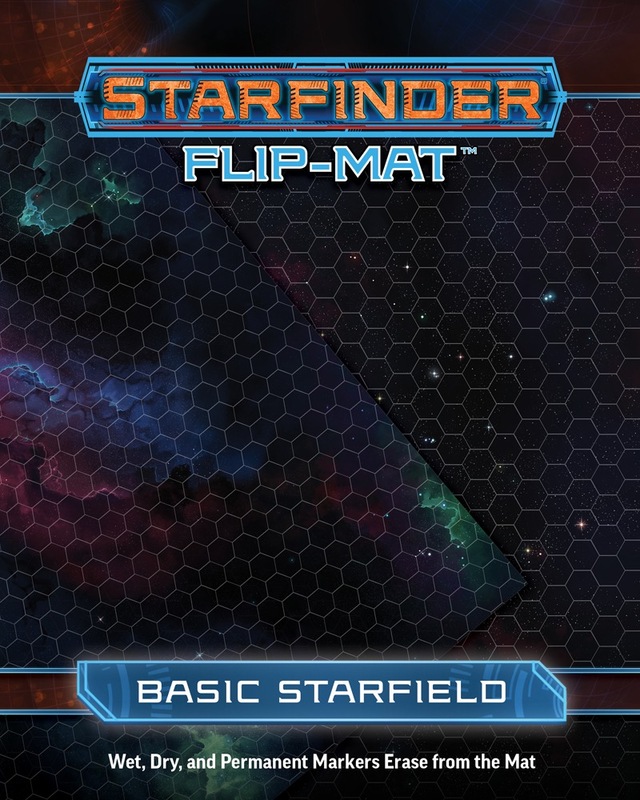 Created with a hex grid for the Starfinder Roleplaying Game's unique starship combat system, Flip-Mat: Basic Starfield comes with two different backgrounds—a starlit void in deep space and the brilliant radiance of a nebula—to let you craft epic starship battles and fire your players' imaginations. Whether your party consists of bold starfighter pilots strafing an enemy dreadnought or intrepid smugglers running a corporate blockade, this extra-large Flip-Mat has you covered. Not much to say: it cleans well, is thick and sturdy, big... and it does exactly what I need it to do-- help me run space combat. I use it all the time and it is great. One of the things that players and GMs who are familiar with Pathfinder but new to Starfinder have to prepared for is that starship combat uses hex-based movement rather than square-based movement. That means you need new tactical grids! There are a lot of other RPGs and miniatures games that use hex mats, but in lieu of buying one of those, you can pick up the un-excitingly named Basic Starfield. 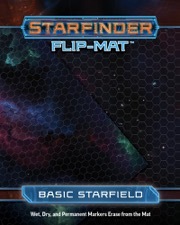 I've used this flip-mat for a handful of starship combats now, and there's some things to like about it. First, it's big (27x39 inches, or the same size as Pathfinder's series of "Bigger . . ." flip-mats). Second, like all Paizo flip-mats, it's a durable product: you can fold and unfold it a bazillion times and don't have to worry about it ripping. Third, (at least in theory), you can use pretty much any marker on it: wet, dry, or even permanent. This reduces the stress of realizing you've screwed up your flip-mat forever by grabbing the wrong marker. However, as some posts in the product page note, the background is so dark that it's really hard to draw on it and have the drawing be visible (unless you had one of those weird white markers). When I've run Starfinder Society scenarios that have obstacles like asteroids, I've had to use blu-tack and pop can tabs because drawing stuff in just isn't practical. One side of the map is what the packaging refers to as "a starlit void in deep space", and that's pretty fair: it's basically a dark black background speckled with tiny white dots to represent stars. In a sense, it's bland, but space . . . is mostly empty, so I can't really blame the designer too much. The other side is pretty much the same but for patches of "the brilliant radiance of a nebula." The nebula is too vague and ill-defined to really serve as any sort of "terrain feature" for starship combat, and the patches are so few that it's easy to forget they're there. If I had my druthers, the flip-side would have something more interesting--some asteroid fields, a moon, the curvature on one end of a planet, etc. Overall, for basic starship combat, the Basic Starfield is bland but serviceable. 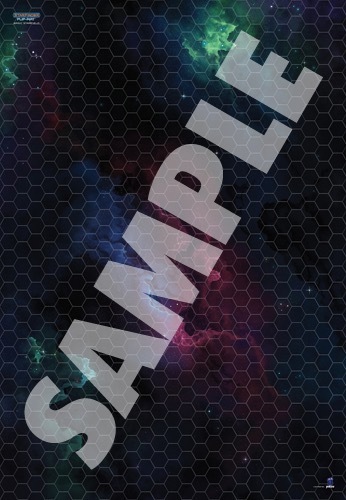 If you already have a hex grid from some other source, your starship combats will not be noticeably improved by this flip-mat; but if you don't have a substitute, this product is better than nothing. The nebula side looks great! The basic starfield side is ok. The two main problems are that the map is too dark to draw on, so you'll need miniatures or tokens to represent hazards and other markings, and the hex grid is horribly aligned: overlapping hexes, grid lines that differ in thickness. The first problem could be fixed by using a light semi-transparent overlay over the whole map, maybe only on the starfield side, such that drawings become easy to see. And the images of these starscapes is very clear and visually pleasing. But... this does make them more difficult to *use* with variety. For example, the dark starfield side is used in an SFS encounter that involves asteroids. Yet the map is printed with dark-black space, no matter which color I drew the asteroids with they were nearly invisible to all of my players! I feel a subdued color for the starfields (a medium-to-dark grey) would have communicated the same message of "you're in space" while also allowing the GM to meaningfully mark on the map, without having to resort to cutting out odd-hex-based asteroids and placing them on the map (hoping they don't get moved when players reach over the large-sized map). ...but as with the squares on the Starfinder Basic Terrain flip-map, the hexes here are too big...nearly 1.25 inches, in fact. This doesn't hurt quite as much as it would for a grid, as you're unlikely to try to line it up with anything else or lay templates, etc. down on it, but it is still unfortunate. Also, I don't see why this had to be as large as it is...as a "basic" product, keeping the price down by using a regular 24"x30" map would have been the way to go. Plus my bigger basic -- which folds the same way this does -- has an odd flap that often gets hung up on things. All that said, the art is good and it gets the job done. It's just a needlessly flawed product that should have been a no-brainer. Really tempted by this one, but I'm waiting to see what's on the opposite side. 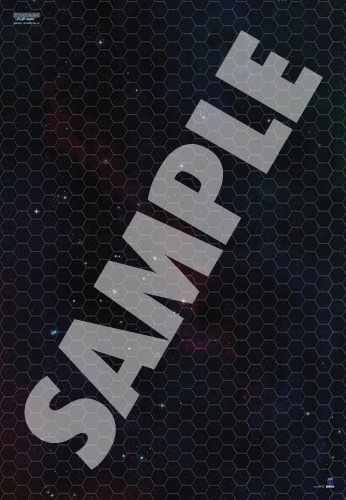 Are there any plans for a mat with a hex grid space combat front and square grid terrain back? I too am curious what is on the other side... Sounds like two different star fields with a hex grid. Maybe plain and nebula? I'd be hyped if it's plain on one side, planetoid or asteroid belt on the other. Not sure what I'd do with two plain space surfaces. Also, I'm curious what sorts of markers would work best on dark or black space. It's not something I've had to deal with on Pathfinder mats. Will these be part of the standard pathfinder flip mat/map pack subscription or do they need to be ordered separately? Starfinder Flip-Mats will *not* be part of the Pathfinder Maps subscription. They will likely have their own subscription eventually. I don't know how 27" can become 8" and 39" can become 10". Not all folded panels are equally sized. 27" × 39" is the size of the "Bigger" maps, maybe you've seen one of them. Correct—this is the size of one of our Bigger mats—we decided not to call it "Bigger" because in this case, there is no smaller version! I think the decision to make this flip-mat as big as possible for starship battles is absolutely right. When you fold the bigger Flip-mat, do they become to 9" × 13" or is it a special way that the map become a 8" × 10". Its a special way, they become 8x10 like the rest. Is that a planet token? The pawns line will use the standard round pawn bases (with a Starfinder logo on the bottom, naturally) for both ships and characters. For the Ninja Division minis, the characters will have round bases; the prototype ship minis shown at GAMA trade show have octagonal bases, but I suspect that isn't final. Updated with final description, product image, and samples! This is currently unavailable in a print edition. I assume this is because you have sold out. (If so, congratulations on such a successful product). Are there any plans to re-release this in a printed format or will there be some other star field printed maps available in the future? I can see it selling well for other games (Star Wars, Star Trek, etc). But before it even *really* releases? Was this ever answered anywhere? And is there an upcoming product with flat, space "terrain" like this? All I can say is that those were conceptual samples provided by one of our licensing partners who has not yet formally announced any Starfinder products. Having purchased one: The hexes appear to be closer to 1.25" than 1". The length of a side? The perpendicular line from one side of the hex to the opposite side? The length from one point on the hex to the opposite point? There seems to have been an issue with the grid for the basic flipmat as well. At least it's bigger - if they were smaller, they'd be much less usable. I doubt a wet erase marker would show up on the black map. Perhaps a silver sharpie would but will permanent marker come off? If so, how would one remove permanent marker from a flip mat? I doubt a wet erase marker would show up on the black map. This was my thought to, however I experimented with mine and it's not too bad. I had expected that a colored marker would be the answer (since the lines of the hexes are white) however it surprised me to find that the red, green and blue that I tried didn't show up as clearly as black. I think it's because the starfield is not actually black but is a distinctively lighter shade of grey. Irrespective, having played around a bit, I think a black marker is going to be the answer (I did use quite a thick marker, which probably helped). Yes on both counts. Since I don't really own anything else (templates, map cards, etc.) that I'd lay over the hexes, I don't mind the size. Though it does blow chunks on the basic flip-mat. It would also be nice to get some word as to when the problem is likely to be corrected. Ok, there's a thing called "window markers" that you can use to write on car windows and other windows that comes off with a wet cloth. A search for "white window markers" turned up half a dozen products that can be bought locally as well as from internet sources. Sweet, that is a really great idea! Are we sure that window markers will not damage the map? I mean, has anyone actually tried it? I've just gone and bought something similar. This is the product I picked up it certainly looks good when it's freshly applied. Thanks Steve...really intrigued by this. 90 minutes after application, it wiped off with a dry cloth. 4 hours after application it needed a damp cloth but still came off very easily. One note of warning, I folded it closed soon after application and some ink transferred to the opposing surface. These are more like paint than usual whiteboard markers. Manageable, but worth being aware of. I'll try again after twenty four hours and after a week, for now though I'm very happy with these. Thanks, CrystalSeas. Twenty four hours after application (well twenty five, actually) and it seems things are just as good. In fact, I could wipe it clear with a dry cloth - although I experimented with ink that had sunk into the crease and that was a little trickier - needed my fingernail. Anyhow, I'm sold that these markers work really well. I'll try to get the rest off in a week's time (I occasionally forget to clean maps up at the end of the session). One caveat is that I'm used to pre-drawing some battlemaps to save time during a session. With this, if I have need to plot something out ahead of time, I'll need to be careful not to fold them up until I'm sure the 'paint' has dried. The transfer of ink issue is noticeable. Your research is much appreciated, Steve. Have you tried an actual starship battle yet? The fact that the hexes are too big isn´t so bad, but the pawns, especially the large ones are too big to fit inside one hex, which makes it a little messy to have close-quarter combats. I´m curious if this will also be the case with these Starfinder Starship minis? The small ones (Death´s Head Necroglider & Ringworks Wanderer) seem to fit inside a hex, the medium ones (Blackwind Sepulcher, Kevolari Venture & Sunrise Maiden) could work too, but the largest ones (Thaumtech Omenbringer & Atech Immortal) probably won´t be able to fly directly in front/behind each other, which makes sense, because why should such large spaceships fly within collision range? This sadly is not the case with the pawns, which are all too large for a hex. It wouldn´t be a problem in Pathfinder, but in Starfinder facing direction is important. The size of the pawns/minis probably won´t matter when it´s one ship against another (or two, or three), as even short range weapons have a range increment of 5 hexes. But i can see this getting a problem in larger scale space-battles, in a planetary blockade scenario or a battle between ships with hangar bays for instance. I don't have a problem with the size of the hexes. I plan on using small bases for all the pawns, regardless of size. They could have been a little bigger, but I guess there's a balance between ease of use and ability to cover a wide range of battles. I think the overhang is only going to be an issue for adjacent ships and I can't imagine that occurring for very long or very often. Final experimental test - a week after application, it wiped off pretty easily. I didn't have a proper cloth, just tissues and a bit of saliva. Even got the ink out of the creases. No mark left on the map at all. Very satisfied with these as a solution. Thanks for sharing this info...definitely ordering one of these myself. Thank you Steve! Now I just need to source such a pen locally, should not be a big issue. For miniatures I have used the Fantasy Flight X-Wing fighters, they work fine, although the bases are square and too large to fit in the hexes. I am searching for a good hexagonal base that fits in the hexes on the map, I will then adjust that base to carry an X-Wing fighter. Chalk pens work great, just like Steve has said. As for where to buy them, it looks like you can get them in the craft section of any store that would have one. I got mine at Walmart (I forget the exact price, but it was less than $5). Once dry, it works just fine. Never smeared, smudged or wiped off during the battle or when folded and being transported to and from the game store. Wiped off with a dry paper towel just fine, no evidence it was ever there. You do have to wait for it to dry, since it will smudge very easily when it is first applied (It looks and feels like wet paint), so you'll probably need to apply it ahead of time before you plan to use it.